This recipe is great for Spring which is Kapha time to give you the taste you love without the added congestion that cheese and dairy can cause at this time. As many of you know, I don't think dairy in many cases is the problem but our digestion is. We can talk more about this at another time. So you love Mac & Cheese but you don't want all that cheese, then you have to try this recipe. I think it tastes great and you can spice it up as much or as little as you like. The other great thing about this recipe is it is fast and easy to make. So put away that box of processed mac & cheese with ingredients you can't pronounce and try this instead.
. 2 heaping tablespoons of nutritional yeast flakes.
. Cook macaroni al dente following instructions on package. Drain and set aside. potatoes 🥔 and onions in the pot and cook for about 10 minutes or until the veggies are soft enough to blend.
. Once the veggies are soft for blending use a slotted spoon to remove them from the water and place them in your blender (I use the Vita-mix). Add the 3/4 cup of cooking water from your cooked veggies to the blender along with all the remaining ingredients.
. Pour your blended sauce over your cooked macaroni in a bowl and mix well, then salt and pepper to taste and serve warm.
. You can also turn this into a baked dish by sprinkling some bread crumb or ground up almonds over the top and bake in a baking dish at 350 degrees for about 15 minutes or until top turns a golden brown. Note: I like to soak my cashews for about 30 min. If you are not using a high speed blender like a Vita-mix though, I highly recommend you do this. Here is an easy as can be recipe to get your dose of Vitamin C! Make a batch of these Vitamin C balls at the start of the week and pop one daily on the go! Mix honey in slowly to make balls not too stickey or moist. Roll into pea size then roll in orange peel powder. Wanted to make healthy pancakes for my family and this is a great alternative to that boxed stuff! Jaggery syrup (use 100% organic jaggery) - if you don't have I use Date Honey! 1. Mix together flour and jaggery or date honey to taste. 3. Add fennel seeds to the mixture. 4. Add sufficient water to get the proper consistency. 5. It can also keep it overnight if you want to make in the breakfast. 7. Cook both sides well. Tastes great when served with kheer. This Ayurvedic version does not use baking powder. Whole wheat has a good balance of carbohydrates protein and dietary fiber. Jaggery is a natural sweetener and is rich in iron content. Babies up to 1 year have increased incidence of anemia and by adding jaggery to food items can help combat anemia. This is a great cereal we just introduced to baby Remy, who just turned 1 year old. Take a look at the video below and see the entire step by step from another one of my posts HERE. Enjoy a quick video I took this morning with my grandson Remy, for whom I have been making kitchari now for about 5 months. When the time came to begin introducing solids to his diet, I really wanted to avoid the traditional boxed cereals that one usually buys. Kitchari is often called the worl'd perfect food, and I wanted my grandson to have some more protein in his diet when we introduced solids rather than empty carbs. Here's a detail of everything that I put into the kitchari (which is just mung dahl beans and white basmati rice which can easily be found in Whole Foods if you dont have access to an Indian market or my favorite online site for my mung dahl and ghee is SVAyurveda). Of course, as with any dietary questions about your baby please consult your pediatrician first!). Takra is an Ayurvedic buttermilk that is a beautiful digestive aid that can be included in our diets to work on strengthening the main digestive fires in our stomach. Takra promotes strength in Vata, is water absorbing in Pitta and promotes strength in Kapha by creating a healthy digestive fire to nourish all our tissues. So here is the Ginger Nectar Recipe as promised. This is a potent tonic to help your digestion. Ginger has a pungent and sweet quality to the taste and it is heating. It is wonderful for bloating, upset stomach, sluggish circulation and is a carminative. Ginger supports heart healthy and generally benefits the cardiovascular system. It is truly “medicine in a jar” It helps the stomach by producing a gastric acid to make digestion easier. (Heating-Pitta do not use in excess). Honey is sweet and astringent and is beneficial to digestion amongst so many other qualities. Honey is able to benefit and nourish the deepest tissues. (Astringent quality-Vata do not use in excess). I use my Ginger Shots about 30 minutes before every meal. In the summer I tend not to need it as much but in the winter I find it helps my immune system tremendously as my digestion is so much better. Combine equal parts of fresh squeezed lemon and ginger juice. Stir in the raw honey to taste. An example would be ½ cup each of lemon and ginger juice then add in approximately ¼ cup of honey. Keep refrigerated and stir or shake well before taking so as to blend honey back in that has settled to bottom of the jar. To make the ginger juice, I peel the ginger then grate it. I take the gratings and place them in cheese cloth and squeeze out the juice. I then squeeze the lemons and add the honey. It really has a nice kick, but be sure to only take a shot at a time as it is very heating and producing too much fire in the belly is not good either. Balance, Balance, Balance. As promised in my last blog about ways to ease into the Fall season's colder temperatures and Vata tenancies, here's a perfect seasonal food that nourishes the body. So put this on your menu at your next Fall dinner party and feel good, no matter what your dosha! Wash rice and mung dal (separately) well, then soak overnight (separately). In the morning drain the water, and rinse well again. In a medium saucepan warm the ghee. Add the kichari spice mixture and saute for one to two minutes. Add rice and mung beans and saute for another couple of minutes. Then add 4 cups of water and bring to a boil. Once the kitchari has come to a boil reduce the heat to medium-low. Cover and cook until it is tender (approx. 30-45 minutes). If you are adding vegetables to your kitchari, add the longer cooking vegetables such as carrots and beets halfway through the cooking. Add the vegetables that cook faster such as leafy greens near the end. Add more water if needed. Typically, kitchari is the consistency of a vegetable stew as opposed to a broth. This recipe makes 4 servings. Happy first day of Fall to everyone out there! With the official changing of the seasons, I thought I would give you a simple recipe to help warm up the digestive system with the cooler weather quickly approaching. This is a 2 part recipe - one for the spice mix that you will then put onto the Apple Ghee Bombs. Apples are predominant right now which means nature is giving us her clues as to what we should be ingesting at this particular time of year, and cooking them ensures that you keep the digestive juices fired up and is easier on your system to balance yourself against the cold. Are filled with antioxidants (oxidation reactions can produce free radicals, which we do NOT want). Have been shown to support heart health. Positively affect the healthy microbiome in your gut. This one works great anywhere you want sweet taste and creates a warming digestive aid. Use generously. I usually grind my own spices, but these 3 don’t grind up easy, so I buy them powdered and mix them in a glass shakey jar from Bed Bath and Beyond (99cents) or any glass jar with lid. I make a small batch and use also on veggies, etc. Stir-fry one apple in a tsp ghee, add a Tbsp or 2 of water if it sticks. Top with sweet spice mix. A light, warm breakfast. Leave the skin on, core the apple and cut up into small cubes. Please feel free to adjust recipe according to your dosha but this is pretty tri-doshic. Put the uncooked rice in a blender and blend. Then grind the almonds in the blender, separately. In a warm saucepan (I like to use my cast iron saucepan) heat the ghee on a low flame and let melt. Once the ghee melts add the rice, almonds, cardamom, salt and water. Allow everything to come to a boil then reduce to a low to medium flame. Cover the ingredients and continue cooking for approximately 5 minutes until done. Place your cereal in a bowl. You can add some maple syrup (can increase Kapha) and enjoy! I Have a Hankering for Carrot Halva! I came across a recipe from a book by Vishnu Dass and made it for some friends who recently stopped by. Needless to say, it was loved by all and I wanted to share the love! It's also known as gajar ka halwa, and it's a unique Indian dessert traditionally served at Indian festivals and in temples. It's actually a favorite during Diwali, the festival of lights, which took place not too long ago! Diwali is a festival that transcends religion and just brings people together! Please take note, the ingredients can be adjusted according to your dosha. Carrot Halva is good for Vata and Pitta but can increase Kapha in excess! Soak the saffron in 1 tablespoon of water for 10 minutes. Melt the ghee in a heavy pot over low heat and add the grated carrots. Cook and stir for 5 minutes or so, until the carrots smell fragrant. Add the milk, stirring constantly, then add the soaked saffron and other ingredients. Keep stirring. Cook over a low heat, uncovered, until all of the liquid is absorbed, about 15 minutes. Stir frequently to prevent sticking. I am taking Rosalee de la Foret's Taste of Herb course on line and found there are ways to boost these already potent ingredients. Here is a helpful tip I found on a website to ensure you get the utmost out of the root. If you're looking to get the health benefits of turmeric, pair it with pepper. 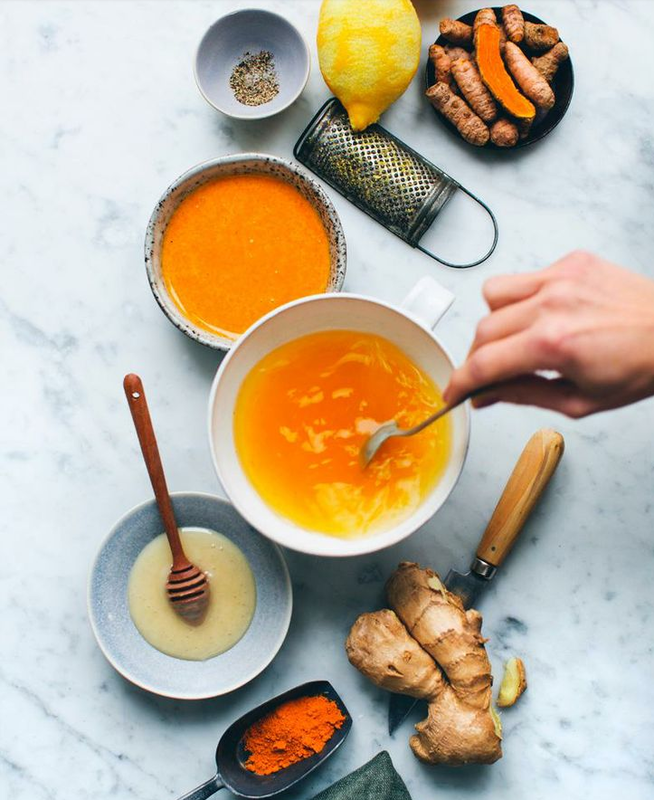 Herbalist Rosalee de la Forêt tells us, "To get the most out of your turmeric add 3% black pepper to the mix. Black pepper improves the bioavailability of turmeric, making smaller doses more effective." This works out to about 1/2 teaspoon of ground pepper to 1/4 cup of turmeric. To make it easy, I simply premix pepper into my jar of turmeric. So spice things up and get the most out of your tumeric! These tiny little energy balls pack a serious punch! Had such an amazing time leading the Intro To Ayurveda workshop at the Birchwood Center in Nyack! Thank you again to all who made it out. Made with dates, raisins, cranberries , walnuts, almonds - all organic and ground in food processor then rolled into balls and dipped in coconut. All you need is one - Contains amazing nutrients and checks hunger in between meals and yes it gives you energy. A wonderful substitute to those packaged bars! As promised - here's the recipe. Enjoy! 1. In a bowl, soak the dried fruit in boiling hot water for about 10 minutes. Wash and drain well. Please do non soak longer because the fruit will become too watery and change the consistency of the Energy Balls. 2. In a food processor, blend the dried fruit and the vanilla extract to a smooth paste. Set aside in a large bowl. 3. Again in the food processor, separately grind the almonds, then walnuts to a fine meal. Add to the bowl of dried fruit. 4. Mix really well-using your hands makes it easier. Make balls (no bigger than 1-inch) and roll them in the dried coconut. Tried out a great recipe recently with friends that was a hit! This could also be really nice for breakfast as you get a healthy dose of energy from the nuts and banana! Use organic when possible for the ingredients below. I also used unsweetened apple sauce and shredded coconut. Mix all bread ingredients together except for the flour and macadamia on a med setting in a food processor or blender. Then add the coconut flour and mix until it reaches a dough-like consistency. Fold in the macadamia nuts to the food processor. Put into the oven for about 40 - 45 minutes. Take out and let it cool before serving. Great recipe for spring and heading into summer to manage kapha! Pomegranates, the sweet variety, are great for reducing excess pitta. Their slightly astringent quality suppresses mucous and is good for balancing kapha. The added lemon juice in the recipe helps to neutralize vata. This recipe is best for Pitta and Kapha, but it's also good for Vata in small amounts. Whisk together the lemon juice, pomegranate juice and maple syrup. While whisking continuously, slowly drizzle in the safflower oil until it's well incorporated. Add the salt and pepper. Whisk and taste. Adjust the seasoning with more salt and pepper, if needed. This is a wonderful year round herbal preparation to prevent colds and flu's. Elderberry syrup is anti-viral, warming and loaded with flavanoids and anti-oxidants. Try to use organic for all ingredients when possible. Strain liquid into a bowl and tamp it down well to get out all the juice. You can compost the remains if you like. Store your Elderberry Syrup in a closed jar in the fridge for 2-3 weeks. Take a teaspoon to a tablespoon a day as a preventative. If you do catch a cold take it every few hours. So now here is a great tea to start sipping to improve circulation and help with the morning mucus that starts to accumulate in the end of winter, beginning of spring. Mix equal amounts of cardamon seeds and fennel seeds and slice up strips of fresh ginger (recommend appx. a 1/4 inch strip for each 1/4 teaspoon of your mixture of cardamon and fennel). Place all ingredients in a coffee grinder (that is only used for spices not for coffee) or use a pestle and mortar. Place a 1/2 teaspoon to 3/4 teaspoon (depends on taste) and steep in a cup of hot water for 5 minutes. Enjoy! Wonderful way to start your morning after your cup or two of hot water of course. Maybe sip as you go through your morning rituals. A delicious beverage before bedtime that will help to nourish your lungs, bones and blood overnight as well as aiding sleep. Bring the water and milk to the boil in a saucepan that is good for pouring. Pour into a cup and add the turmeric, nutmeg and honey. Stir well.